You are at:Home»Travel Themes»Adventure»How to plan a trip to Triund trek over weekend? 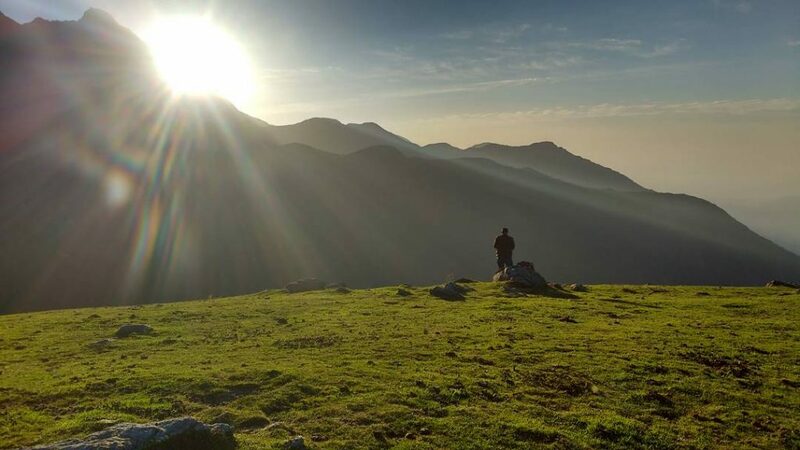 How to plan a trip to Triund trek over weekend? Many people refer Triund as the heart or crown of Dharamshala and Mcleod Ganj. The trek to Triund is around 9-10 KMs from Mcleod Ganj, Himachal Pradesh. Triund offers some magnificent views of Dhaulandhar ranges on one side and Kangra Valley on the other side. It’s a beautiful trek surrounded by forests and can be done by people of all the age groups. Perhaps, that’s the reason why it’s so popular in the Himachal Pradesh beginners trek. Triund is located at the foot of the Dhaulandhar ranges in the Himalayas at an altitude of around 2828 meters or 9350 feet approximately. Planning a trip to Triund? Mcleod Ganj lies at a distance of around 500 km from Delhi or about 250 km from Chandigarh. You can either reach by your own car or by using public transport such as train, bus or air. You can take any of the following two routes to reach Dharamshala – McLeod Ganj and further undertake trek to Triund: Delhi – Chandigarh – Ropar – Nangal – Una – Mubarakpur – Dehra – Kangra – Dharamshala – McLeod Ganj – Triund OR the other route is as Delhi – Ludhiana – Jalandhar – Hoshiarpur – Mubarakpur – Dehra – Kangra – Dharamshala – McLeod Ganj – Triund. By Bus: The best option to reach Mcleod Ganj from Delhi is to catch the overnight Volvo of either HRTC or HPTDC. There are other private operators as well that run buses between Delhi and Dharamshala in the evening but I will prefer to choose HRTC and HPTDC due to the reliability of their services. The journey will take around 11-12 hours to reach Dharamshala from Delhi. The bus cost to Dharamshala from Delhi lies in the range of Rs 750 to Rs 1500 depending on the type of bus. By train: The second and the cheapest option but a hectic one to reach Mcleod Ganj or Triund is to travel by train. One can take a train to Pathankot which takes around 6-7 hours and costs around Rs 250 for the sleeper coach. There are various buses or shared local jeeps that run from Pathankot to Dharamshala in every one or two hours and cost around Rs 150. Dharamshala to Mcleod Ganj is about 10-12 KM and again various private and govt. buses are available till the evening. By Air: Flights are also available to Dharamshala (Gaggal Airport or Kangra Airport) and eventually, you can reach Mcleod Ganj by booking a private cab. Can I make a weekend trip to Triund? Friday night: Take an overnight bus from Delhi to Mcleod Ganj at around 6-7 PM which will leave you at Mcleod Ganj around 6 AM. Take a room for being fresh or you can use public toilets as per your choice of comfort. Saturday: After getting fresh, eat a good breakfast and carry some fruit and water for the trek to Triund. 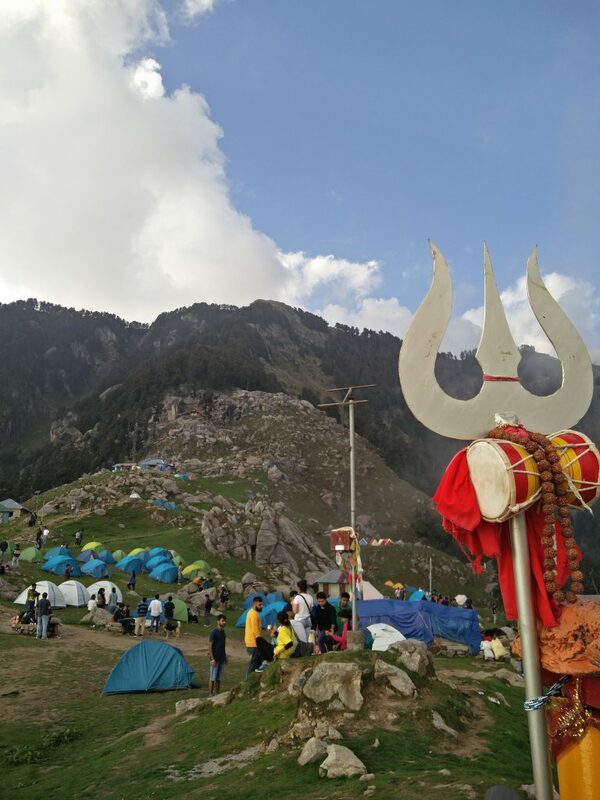 Book a cab till the Galu temple and start the trek to Triund by 10-11 AM. The trek traverses through the beautiful forest, offering some nice vantage point views. You will reach Triund by 2-3 PM. Book your tent by contacting the people at the cafes if you don’t have any. Enjoy the gorgeous sunset, watch the sun fall beyond the horizon and rest for the day. Sleep in your camps or pre-arranged stay or the Forest Rest House in case you get the booking for it. Sunday: Wake up early and watch the sunrise. Have some breakfast and start trekking down to Mcleod Ganj. Take the route which goes from Bhagsu Naag Waterfall and spends some time at the waterfall. If you have some time left then you can explore the town of Mcleod Ganj and catch a return bus to Delhi in the evening. 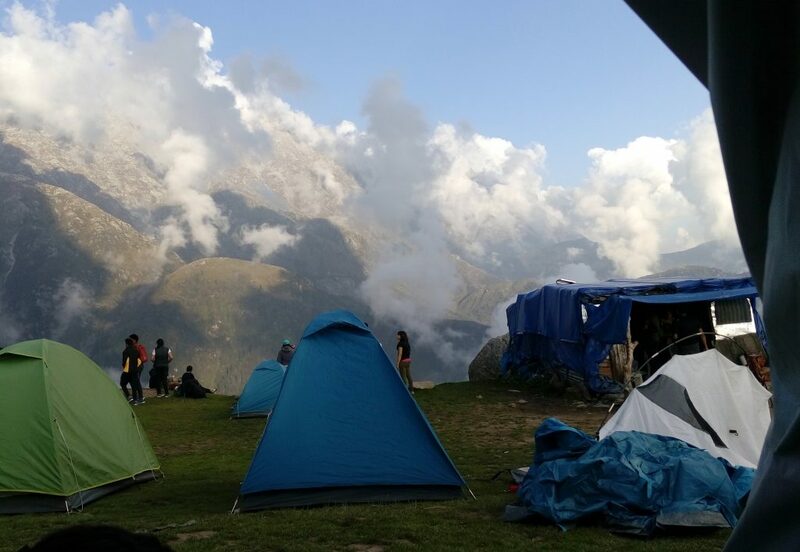 Tents are available at Triund at the price of Rs 300-500 per person, availability on the spot may be an issue at times. 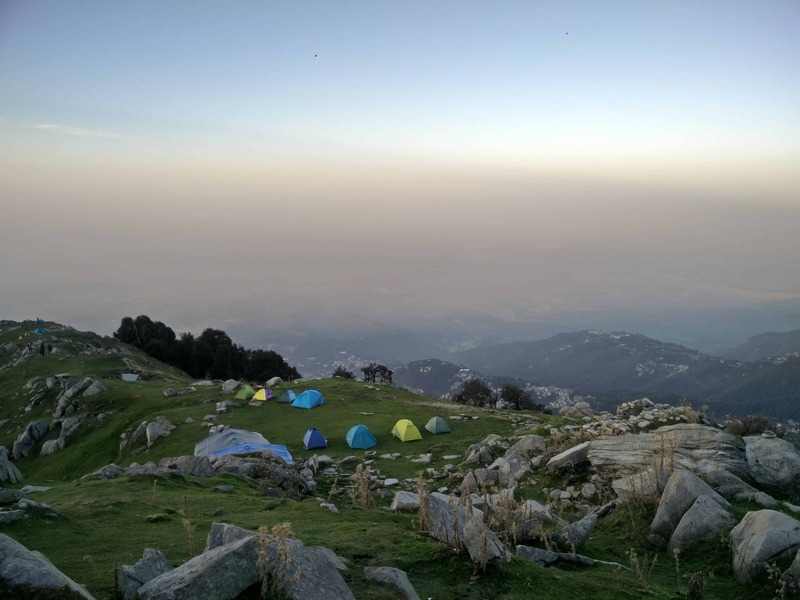 You can also carry and pitch your own tent at Triund. There is also a Forest Rest House at the top where you can stay but booking it is not that trivial. You have to book in advance for the Forest Rest House from Dharamshala because there are limited rooms. 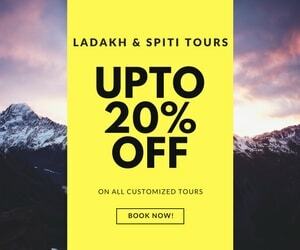 Otherwise, you can pre-arrange the stay with some local travel agents at Mcleod Ganj and they can help you take your camps and food up there for you. Even some shops in Mcleod Ganj also offers camping and trekking gears on rent basis. If you hike or trek or travel in the Himalayas, it is better to purchase your own tent or camp and Quechua ones are usually good ones and can be purchased at Amazon India easily. There aren’t much food options available at Triund. There are few dhabhas/tea shacks where you can eat some food. The food is a little costlier at the Triund top, so the best way to save money it to carry food, some fruits as well as a water bottle with you. A bottle of water costs Rs 50, Rajma or Dal Chawal plate costs Rs 140 and a plate of Maggi costs Rs 70. It is better that you carry a lot of water and fruits by yourself. Mcleod Ganj is the last point where the ATM’s are available. So, it’s better that you carry enough cash. All the cellular networks are available in Mcleod Ganj. Triund does not have a strong connection, usually, the network comes and goes. It is better to stay disconnected for a while, give it a try and I am sure you will enjoy it. Trek starts from two places in Mcleod Ganj. The last point where any vehicle can reach is the Galu temple. There are various options to reach Galu. One can start trek right from Mcleod Ganj or can book a cab or an auto to the Galu temple. This trek can also be started from Bhagsu Naag waterfall. The hike or trek or trail to Triund is easy-moderate and well marked up mostly. The trail takes you through the beautiful forest. Apart from few patches here and there, the trek is fine. 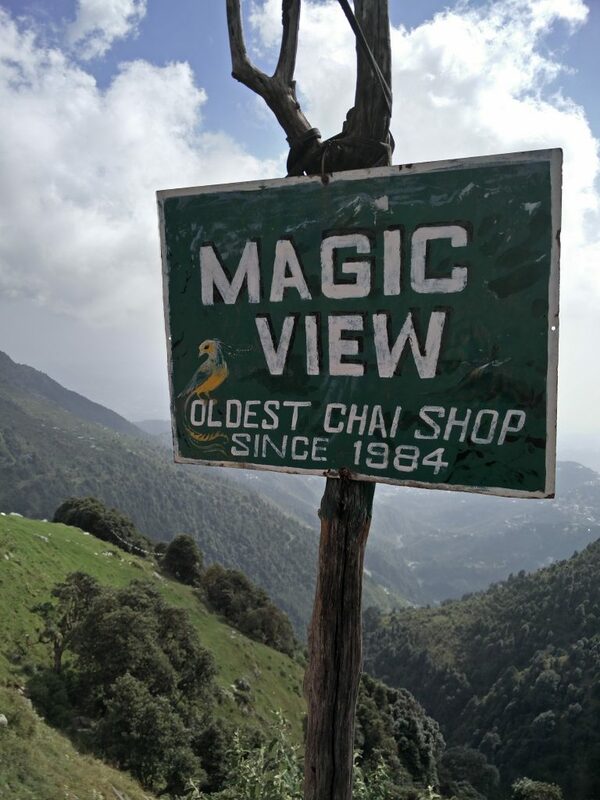 There are various small shops and tea shacks on the way to the Triund where you can have Maggi and tea. There is a magic viewpoint at the half-way of the trek which is a decent site to witness some lovely aerial views. Sunset and Sunrise are worth witnessing at Triund and in case you love photography, you will surely love them at Triund. This trek can be done without the help of a guide or a porter. The trail is mostly well marked and crowded. However, do not stray away from it. There may be some problems while trekking when there is snow though. Please bring all your waste material back to Mcleod Ganj or Dharamkot where you can easily dispose them in garbage bins, hoping it seeks the right disposal thereafter. 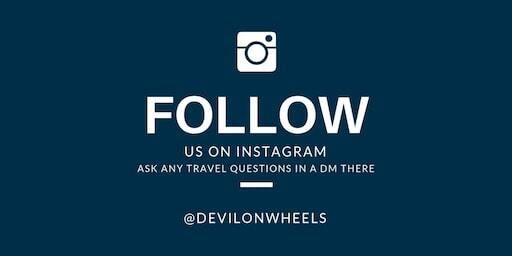 Be a responsible traveler and I hope you read DoW tips on Responsible Travel in the Himalayas. In the end, if you like the article, please feel free to share it with any of your family or friends who are planning to make a trip to Triund. In the next article of the series, I am going to talk about some other lovely trek in the Himachal Pradesh. I am a college student trying to explore this world as much as possible. I write about my experiences and all the information about the places which I've visited. Read about my journeys here. Hi, Dheeraj. From last 3 to 4 years I keep following and read your articles. Even visit many places as suggested by you mainly ladhakh trip awesome. I really admire your effort and way to explain. Now I have quit the job ,is their anything for me with you and could give satisfaction for myself. By profession I am engineer but not got satisfaction that’s why I left. My contact no. Is 7859945503 Manish sharma. But except above, you are doing so good.